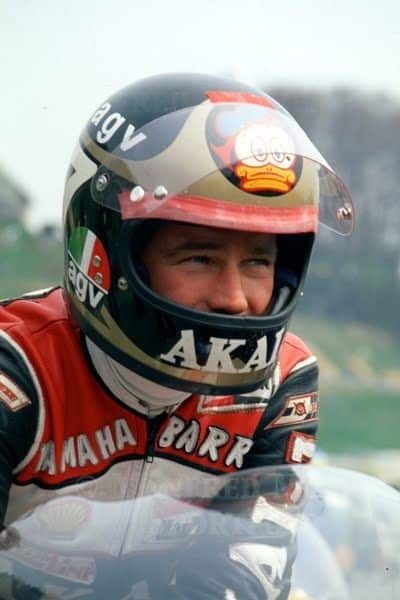 Barry Sheene was one of my ALL time heroes as a teenager, I watched him race at Snetterton by Grabbing my Crash helmet that had no guts in it, I rolled some newspaper up and stuck it in there, I hitch hiked to the track, ran along the side field by the hedges and jumped the fence, just to watch him battle with Kenny Roberts, I will never forget that. I watched him race and then I had a long haul back to my house, so I began to stick my thumb out- numerous cars and bikes passed me and I was a little annoyed as to not getting a lift- as my mum had no idea I was at the races, she thought I was at my mates house up in Elveden Village, so had to be back by dark and the clock was ticking. So out goes my thumb, I see the driver shake his head saying sorry, so being frustrated, I gave him the 2 fingers. Feck me! it was my Hero Barry Sheene and I just gave him the 2 finger salute! I was devastated that i had done that but will always remember it. Barry Sheene’s 1976 and 1977 world championship-winning race bikes have arrived at Suzuki GB, ahead of the Barry Sheene festival at Oliver’s Mount next month and as part of the 40th anniversary celebrations of Sheene’s first world title. The bikes have been shipped directly from Australia for various events in the UK this year, and will be on display at the festival to celebrate the achievements of Suzuki and arguably Britain’s greatest world champion. Also on display will be a collection of classic Suzuki road bikes, including the GSX-R750F that was restored at Motorcycle Live last year, and the TL1000S that was built from brand new parts the year before, highlighting Suzuki’s commitment to its Vintage Parts Programme. Suzuki GB’s Tim Davies, said, “With it being 40 years since Barry’s first world title, this year’s festival marks a very special anniversary, which is why we wanted to be a part of this event for a second consecutive year to celebrate such an occasion. The event at Oliver’s Mount is always a good one, but we decided to step it up a notch for this year’s event, and the display of the two championship-winning bikes is the first time that they have been displayed together at such an event in the UK. Another cool old documentary about Barry on TV back home on Channel 4. Race of the year 1977 a year before I left school. Barry Sheene at Daytona on Practice when the Crash almost kills him. This was a documentary filmed by Thames television back home. Not great quality but real History. A continued version with commentary from Murray Walker. One of my other heroes “Rocket” Ron Haslam, team mate, banging it out on the track, Epic. This entry was posted in Blog and tagged 2 stroke, 4 stroke, Barry Sheene, Brands Hatch, cafe racer, daytona, expansion chambers, gp races, Heron, Mallory Park, oulton park, road racer, snetterton, suzuki, Trans Atlantic races. Fathers Day Roadster Show this weekend.